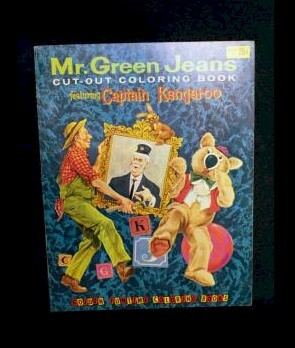 Based on the Captain Kangaroo children's tv show, this coloring book is quite rare and in like- new condition. Features all the Treasure House characters. Bob Keeshan started this show when he was still in his twenties, and over time, he grew into the role and required less and less make-up. I always felt a little uncomfortable with some of the mute characters on the show such as Bunny Rabbit and Dancing Bear. And how many of you as pre-schoolers were spooked by Grandfather Clock and his clacking eye-lids? Website design and hosting by Sohodojo Business Services. Item 255 of 466 items displayed in viewer. 0 items in cart.